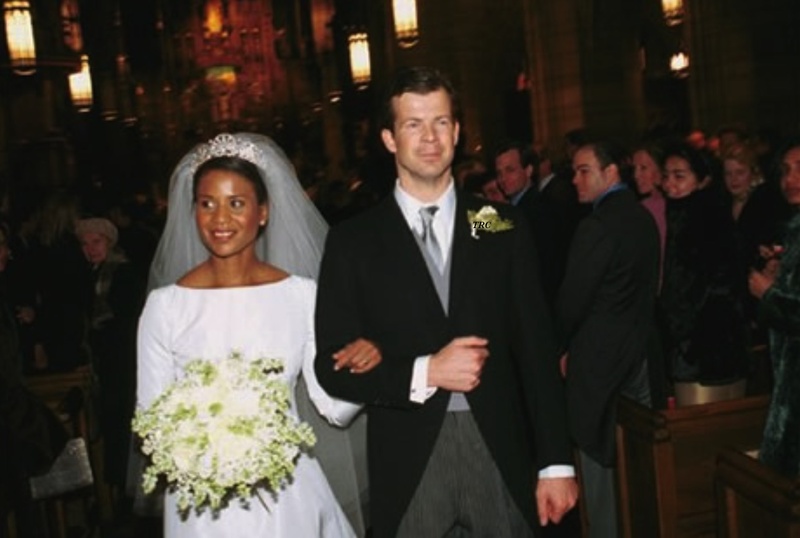 On January 29, 2000, HSH Prince Maximilian of Liechtenstein married fashion designer, Angela Brown, at the St. Vincent Ferrer Church in New York City. The couple met in 1997 at a private party in NYC. At the time, Prince Maximilian was working at a mega bank while Angela was working with designer, Adrienne Vittadini. Angela also had her own small fashion label entitled, A. Brown. Two years later the couple were engaged and Angela resigned from her job. Over 500 guests attended the stunning wedding including HSH Prince Hans-Adam II and his wife, HSH Princess Marie. The groom’s brother, Prince Alois and his wife Princess Sophie were there and so were Prince Constantin and his wife Princess Marie and Princess Tatjana. Today, the couple have one son and currently live in Germany where Prince Maximilian works for a wealth management company. Unfortunately, it is unknown if Princess Angela still designs clothing, but I can assume that she does something interesting. The Prince and Princess every so often take part in official events in Liechtenstein including the festive National Day which is held every year in August. The Princess was born in Panama and came to the United States when she was young. She graduated from Parson’s School of Design. Began working at a major fashion house. Had her own label, A. Brown. She is several years older than her husband. Princess Angela is so private it’s like she doesn’t exist. I would take her as a leading lady role model for girls…fun to read about. Wow, what a waste…but it’s her business. The entire princely family of Liechtenstein is very private. When Panamanian born Angela Brown married Prince Maximilian and joined this noble family, she became just like them, very private. I do not blame her. She is not a recluse either. Prince Maximilian and Princess Angela do attend many social events and royal weddings across Europe. Both the white American and the African American media have ignored her for their own reasons.The former because princess Angela is not white and the latter because Princess Angela is not African American. Panamanian and other Latin American press have written stories about her. I am pretty sure Princess Angela and Prince Maximilian will be attending the wedding of Prince William and Kate Middleton this coming April. But, I must disagree with one of your statements. You are correct that Their Serene Highnesses are quite private; however, I honestly do not believe that the reason why the American media ignores the couple is because HSH Princess Angela is not white. Far from it. The European media rarely reports on the Princely family as well. From time to time you will hear snippet about the family as well as HSH Prince Maximilian and HSH Princess Angela, but it is not because she is not white. Again, they are private and do not carry out official duties for their country. Sure the couple will show up for Liechtenstein’s National Day, but that’s it. As for the couple attending royal weddings in Europe, I cannot recall if they have or have not. If you have any reliable information please let me know. Like you, I am interested to hear more about this couple. In regards to the couple attending the upcoming British royal wedding, I highly doubt they will attend. Most likely, either HSH Prince Hans-Adam and his wife Princess Marie will attend or HSH Prince Alois and Princess Sophie will attend. Why is he nuts? Because he married a black woman? You might want to do some research. 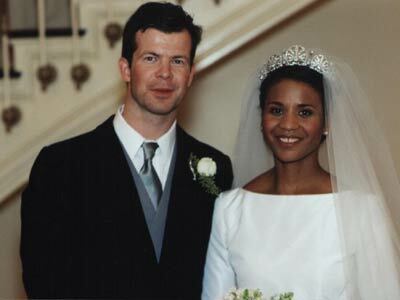 The British royal family has black members by marriage and birth. So does the royal house of Monaco and other royal families have Jewish and Asian members. This is not knew. Remember Queen Elizabeth stated that she had the right to rule and the right to hold all of her titles due to her African and Asian ancestry. 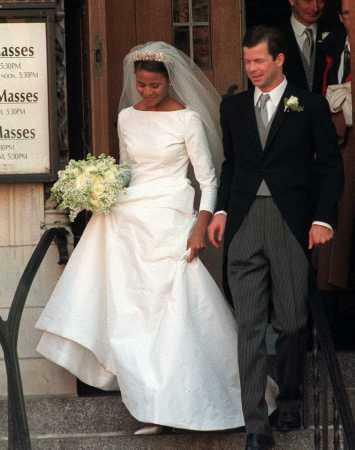 The wedding must have been a low key event in New York; because I have lived in New York city for over twenty add years and the the mourning of kate and william wedding is when i heard about princess angela. I have to google it to believed. I think they make a beautiful couple I know they would have a long and wonderful life. Congrats on 11 years of marriage. I love this couple and I do not blame them for being so private. These two people made their marriage their business and nobody elses. Even though I would love to see more of them. I too wish we saw a little more of them. Considering that she is also eleven years older than her prince, this must really be a a matching of souls. If anyone knows of similar (dark and light) couples like them…I would love know! There are probably more somewhere in history but these are the current ones. Hope this helps. If they want to be known, they would be known. Obviously they are either too shy for the tabloids or they just want it nice and quiet. They have their family, with no interferences from wild women trying to take her place. This is just as it should. So happy for them both. Were they in attendance at the wedding of Prince William and Kate? some people just cant leave people happiness alone. They live their lives the way the want and that is good enough for me. If they are shy or whatever the case is, that is what they want. i am very happy for them. They have the love, understanding and caring and God’s love. to God be the glory of this fine couple, whom i believe God has joined together.